I’m pretty sure I could count on asking anyone my age if they read Where the Wild Things Are when they were young and they’d probably look at me funny. Everyone read this book. And I bought a copy for my niece a few years ago to make sure she would. 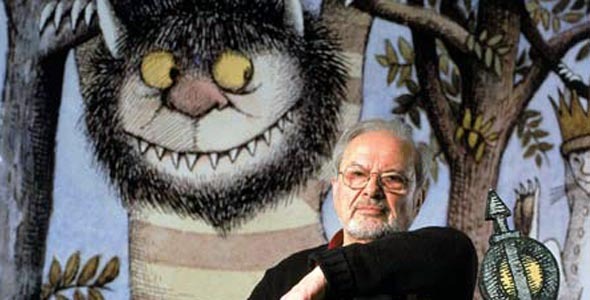 Its author, Maurice Sendak, died yesterday. He was 83. On Fresh Air with Terry Gross last night, they aired segments of his interviews that they had broadcast over the past couple of decades. And so faith in God, for this remarkable, sensitive, thoughtful, artistic man, is equated with a need for something to get through life. With that definition of “God,” I might have to say I don’t need faith either. If I wasn’t a theist, what could otherwise get me “through the narrow straits of life” are those things that I, as a believer, must sometimes call idols in my own life if I were to name them for what they are. In other words, I don’t believe in God because I don’t love art. I don’t believe in God because I don’t depend on beauty. I don’t believe in God because music does nothing for me, or reading does not satisfy me, or nature or exquisite architecture does not give me peace. I believe in God not because he is about “getting me through the narrow straits of life.” I could do this with my own Melvilles, Dickinsons, and Mozarts. I believe in God, and I have a choice for faith, because not only of what I believe God is but because of what I believe God is not. That is, he is beautiful, but he is not the beauty found in one mere sonnet. He is just, but he is not the totality of a righteous decision made the courts. He is love,but he extends way beyond the love that we are capable of demonstrating, or even imagining. He is the creator, but his creative power is not wholly enveloped in these small vessels. These things, while meaningful in themselves, are pointers to some(thing/one) else. I think I could instruct Sendak on one simple point. But, like all good teachers, I would need to learn my own lesson first. I think we all, for that matter, could learn to do one thing better and better when we are enjoying these things I’ve called “pointers” — LOOK. ← Some Luke Timothy Johnson for those who put too much stock in government.